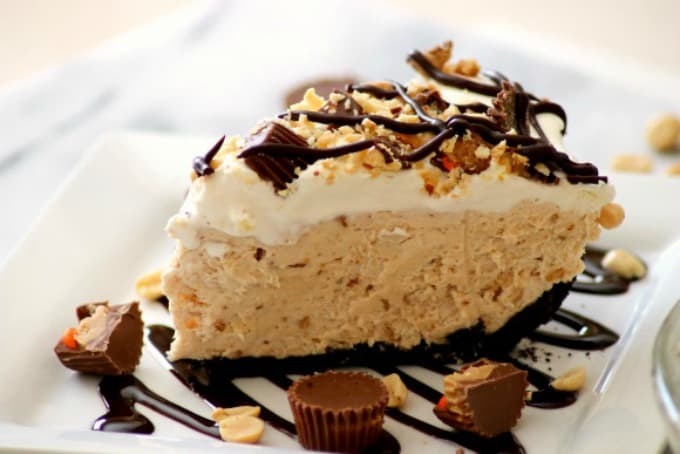 This No-Bake Peanut Butter Pie is the perfect dessert for peanut butter and chocolate lovers. An Oreo crust, fluffy peanut butter filling, fresh whipped cream and the perfect toppings make this treat a great choice for company or family game night! 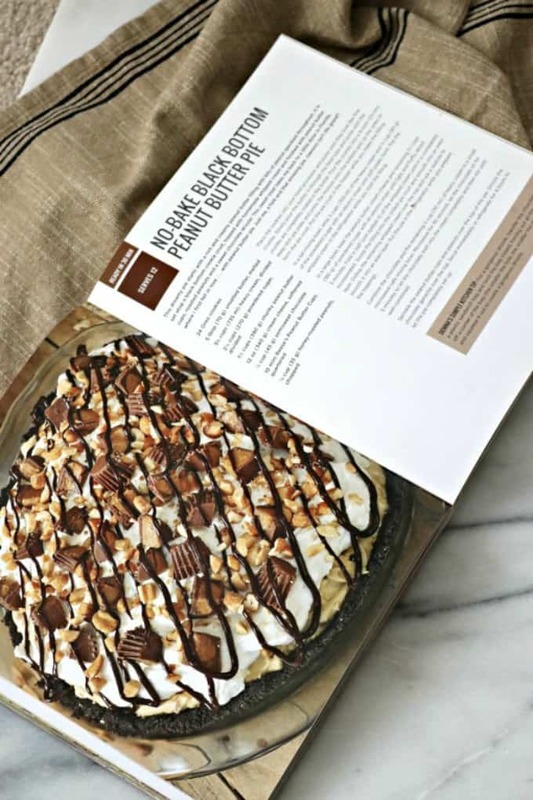 This easy and delicious No-Bake Peanut Butter Pie is from Chad and Donna Elick’s new cookbook, “The Simple Kitchen – Quick and Easy Recipes Bursting with Flavor”. It’s just one of the many you’ll find yourself making again and again. You can find Chad and Donna’s new cookbook HERE! Can I tell you how very much I’ve grown to love cookbooks? Growing up, it was always fun to look through my mother’s and grandmother’s I especially loved mom’s Betty Crocker’s Cooky Book! It was from like 1963 and all of the cookie pictures in there were AMAZING! We always made the Chocolate Crinkles because they were my favorite and I so loved the way they looked with the powdered sugar on top. I have a great collection of cookbooks, but one can always have more! In the next few months, you’ll see me reviewing a few of them. Quite a few of my great and talented blogger friends have come out with some pretty fantastic cookbooks and just in time for the holidays! They’re going to be great to give as gifts or receive, so be sure you’re putting them on your own Christmas wish list, too! One thing I’ve started doing since my children are young adults and are off on their own, is giving them cookbooks now for Christmas every year. It not only starts their own collection, but also increases their interest and excitement in the kitchen. Besides, it’s always great to try new recipes! Donna and Chad are the talented and creative force behind The Slow Roasted Italian blog. I’ve “known” them for years! Seriously. Donna did a guest post for me WAAAYYYYY back in August, 2011 when our blogs were just babies. Wow, that seems like SOOO long ago! It’s amazing to think how blessed we’ve been, the opportunities we’ve had and the places we’ve been since we started 6 years ago. To think that we created these blogs from nothing and now we’re working our ultimate dream jobs full-time just seriously blows me away. Donna’s guest post of the Chocolate Sformato with Amaretto Whipped Cream is a treasure. Not only is it a fantastic dessert, but I love that she was able to provide me with such fantastic content so early on in her blogging career. She’d only been doing it for a month and I knew then she was well on her way to awesome and amazing things and their fantastic new cookbook is just the beginning of many wonderful things to come! So when I said I’ve “known” them for years, I don’t lie. We’ve been friends thanks to the internet since 2011, but have never met in person. That needs to be remedied, especially since we live ONLY 20 minutes away from each other. Too funny! 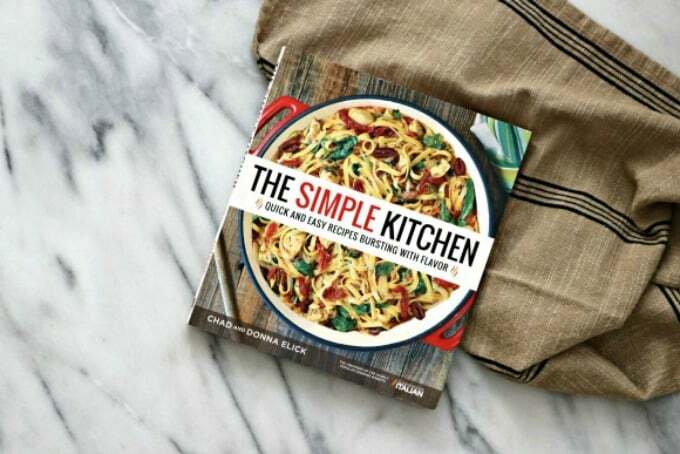 There are SOOOO many great recipes in The Simple Kitchen Cookbook that I honestly had trouble deciding which one to put on the blog. I made the Cheesy Buffalo Chicken Taquitos and m y men loved them! They’re going to be great to serve up on game days for sure. I also made the Creamy Beef Stroganoff with Egg Noodles for dinner and that was a hit as well! I’m looking forward to making this Homestyle Chicken and Biscuits because not only does it look delicious, but it’s also super easy for clean up as it’s made in one pan! This Easy Homemade Alfredo Sauce Recipe is sure to be a hit with my men. Who doesn’t love an easy Alfredo sauce? I remember growing up and having pot roast at Grandma’s on Sunday. This Crockpot Pot Roast is FULL of flavor and is going to be a delicious dinner on a busy weeknight as well! I’m sure there’s something for everyone in this great cookbook! With 8 great chapters ranging from appetizers to desserts, one-pot wonders to everyday kitchen essentials I guarantee that this is one cookbook you’ll go back to again and again! 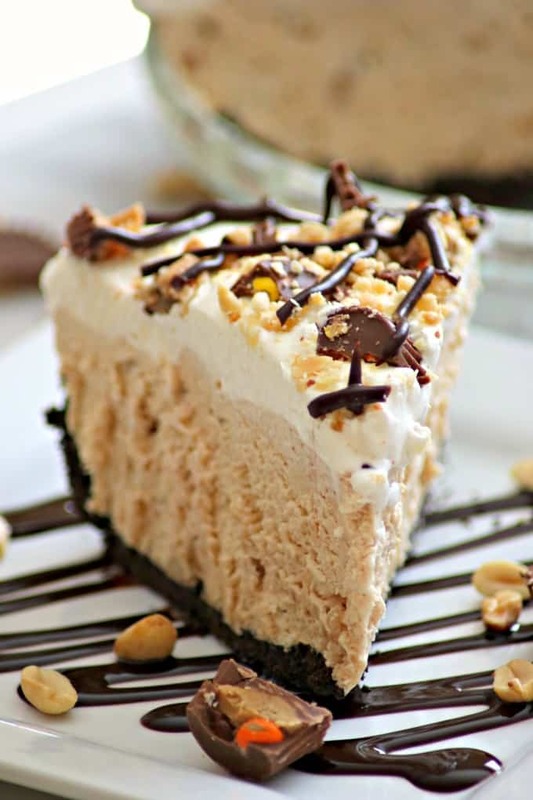 This No-Bake Peanut Butter Pie will be a great dessert any time of year! It will be a delicious treat after enjoying my Chicken Mozzarella Pasta, Lasagna Rolls with Meat Sauce for dinner. You can even put it on the menu for game day in addition to serving this Pepperoni Bread. Your hungry guest will love it and be back for more! This No-Bake Peanut Butter Pie with an Oreo crust, peanut butter filling, and fresh whipped cream make it THE perfect choice for game night or any night! Place the cookies into your food processor and pulse until they look like fine crumbs. Slowly pour the butter in through the feed tube and pulse until the crumbs are completely coated in the butter. Pour the crumbs into a 9-inch (23-cm) deep-dish pie plate and press the mixture onto the bottom and up the sides to form the pie crust. Place the pie crust into the freezer while you prepare the filling. In a large mixing bowl, whip 3 cups (705 ml) of the heavy cream and 3/4 cup (90 g) of the powdered sugar with an electric mixer until stiff peaks form. Put the whipped cream into the refrigerator while you start the filling. In a large bowl, beat the peanut butter, cream cheese and remaining 1 1/2 cups (180 g) of powdered sugar with an electric mixer until light and fluffy, about 3 minutes. Fold in half (just eyeball it) of the whipped cream until it is completely incorporated. Scoop the filling into the chilled pie crust and smooth into an even layer. Put the pie into the refrigerator while you prepare the toppings. Combine the chocolate and the remaining 1/8 cup (30 ml) of heavy cream in a small microwave-safe mixing bowl. Microwave for 45 seconds, let the chocolate sit for 5 minutes to let the chocolate melt into the cream completely and then stir until well-combined. Sprinkle the peanut butter cups and peanuts over the top of the pie. Drizzle the chocolate ganache over the top. Serve immediately or refrigerate for 4 hours to let the pie completely set up. Be sure to order your copy TODAY on Amazon and remember, it will make a great Christmas gift for all of the beginner, seasoned (no pun intended 😉 ) and pro cooks in your life. I’m excited to give it to my kids this year! Also, be sure to check out all of the great recipes on The Slow Roasted Italian and follow them on all of their social media, so you’ll never miss their new recipes! We love this pie. It is such a southern classic and an old time favorite of mine. I am so happy you enjoyed the book. And what a delicious pie it is, Donna! Thanks so much for creating such a great cookbook. We’ve already made quite a few recipes from it and look forward to so many more! This looks so fantastic! I need to make this! Thanks! Yes, you could do that, Yeri. Hope he likes it! This is such a mouth-watering dessert. Everyone will be going to love it. cant wait to try it. 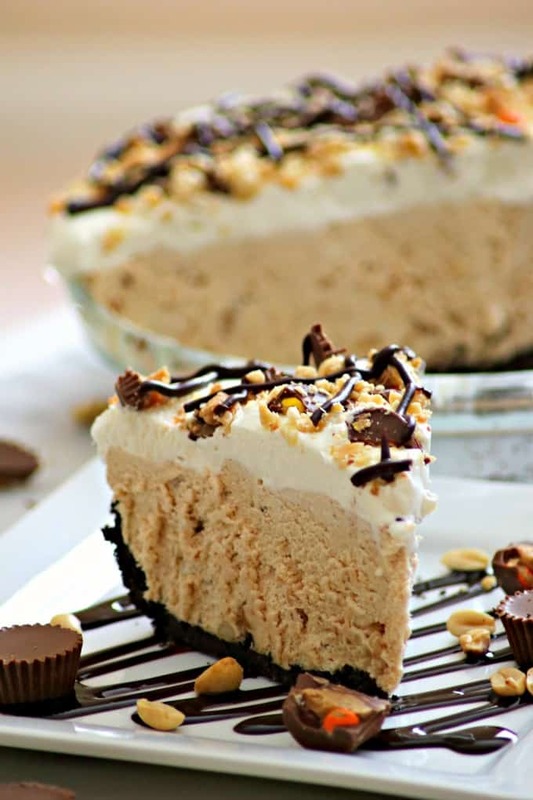 I was never a fan of peanut butter pie, but this pie is absolutely delicious. My whole family loves it and request it quite often. Thank you for this recipe. I will be making this pie forever! So glad you loved it, Robin and thank you for letting me know!